While there are a growing number of electric scooter and motorcycle makers out there, there’s not many that are making a cargo-carrying, foldable version. San Francisco-based startup Lit Motors has been developing an electric scooter that can carry a large box (or a person) and can fold down into almost half its driving size. For our latest Green Overdrive show, we drove around with Lit Motor’s CEO Daniel Kim on the company’s electric cargo scooter, and also checked out a prototype of its upcoming electric two-wheel car. The scooter could be available in about 6 months in the U.S. and cost around $2,000 to $4,000, though Lit Motors is looking to focus mainly on selling a more low cost version of the scooter ($500 to $800) into developing markets like India and China. 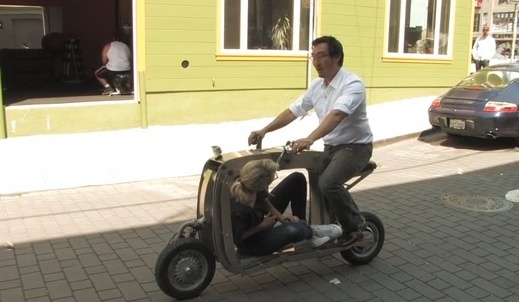 A three-wheeled vehicle called the Carver from the Netherlands does the same thing, but it has two wheels in back and one in the front. Green Lite puts two wheels in front for better handling. If I were an investor, I would insist they focus only on the big idea. Instead of spending time and money on an unprofitable 800$ scooter for the third world, they should go directly to their “big idea”: the fully enclosed crash-resistant electric scooter. People would pay for extra for safety. I don’t get it. There is no information about the bike or the technology. With lithium batteries and a 40 mile range, it seems unlikely they will hit that price point. The 300 lb load includes rider?